The fish that blogs from under the sea! At last the sea temperature is rising! Things are looking up now the water temperature has increased to 11 degrees after the warm Bank Holiday. Bradley has moved into my old crevice home and has a good raft of eggs. The crevice he moved out of has no tompot occupant for the first time in 10 years of observing the reef. A cheeky Connemara clingfish has moved in there! Bertram who is further round the reef is doing well and so is Byron, they both have eggs to look after. 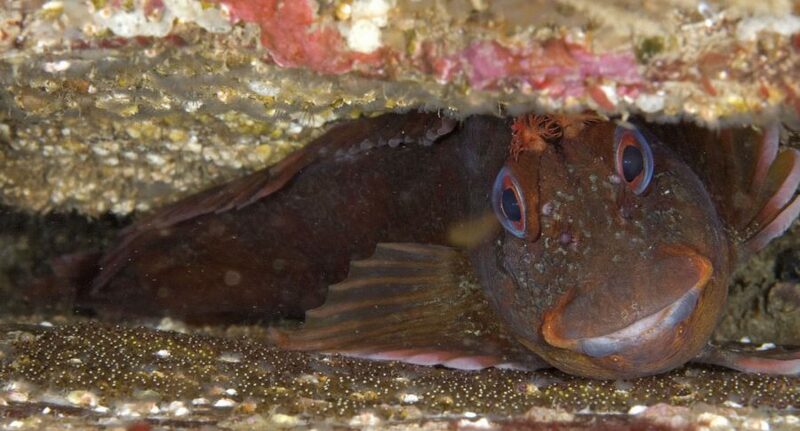 Paul is able to recognise us tompot blenny males individually from our face markings and that’s why we have names; this article in the Guardian is a photo story all about us – please take a look at this link. Author Benny the blennyPosted on 17th May 2018 Categories Animal behaviour, Animal physiology, children's book, combtooth blenny, egg laying, fish eggs, fish with antlers, Paternal care, Tompot blennyTags blenny, fish, fish eggs, tompot blenny, UK, underwater, Wembury, wildlife1 Comment on At last the sea temperature is rising! c) done an “eggscellent” job of attracting the local females in to lay their eggs. I did this by wafting inviting smells (pheromones) from the enlarged glands just under my belly. Back on 24th March, Belinda was the first female to respond to my smelly message, she came in and had a good look at my home, I gave her a show of my bravado by whizzing round at lightning speed. Once I’d calmed down, she then decided to lay some of her beautiful dark purple eggs with me, which I fertilised immediately. Since then I’ve had visits from Brenda, Barbara, Bertha and Becky too. Belinda has been back twice. I’m very particular where they lay their eggs so you will see in the video that I boss them around to make sure they lay their eggs just where I want them to! They tolerate a little gentle barging and fin nibbling as they know I have a good track record as a Dad; I’ve lived in this crevice for 3 years and have been very successful looking after eggs. I noticed this year that the females visited us more established males in the better crevices first. Byron and I are the ‘top dogs’ on the reef and we both had a good layer of eggs in our crevices a week or two before the females started to lay eggs with Billy, a small younger male tompot blenny with an inferior crevice home. Just after the video for my last blog was taken, I kept seeing dark shapes being swept past my crevice home. It took a while but then it dawned on me what they were. The waves had ripped lots of kelp (a large type of seaweed) off the rocks around my home and it was being swished around in the waves. I’ll have to be careful when I venture out as it could damage me. 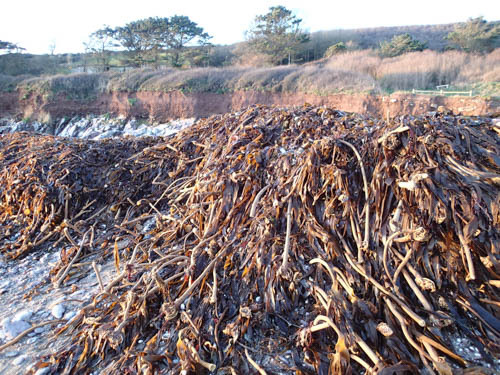 A lot of the kelp will be washed up on the beach. This photograph shows a pile, 1 metre deep, that arrived all in one night… pretty impressive! The recycling gang will have to get into action on the beach; sand hoppers, beach hoppers, kelp flies and other small creatures will break it all down over the next month or so. More broken off kelp will stay around the gully in front of my rock, it will be eaten by thousands of amphipods and isopods (small crustaceans). Those amphipods and isopods will eventually be a nice feast for me, so that’s the good side of the storm, yum yum! This smallspotted catshark egg case (mermaid’s purse) was washed up with the seaweed too! You can see that all us fish have different ways of bringing on the next generation. 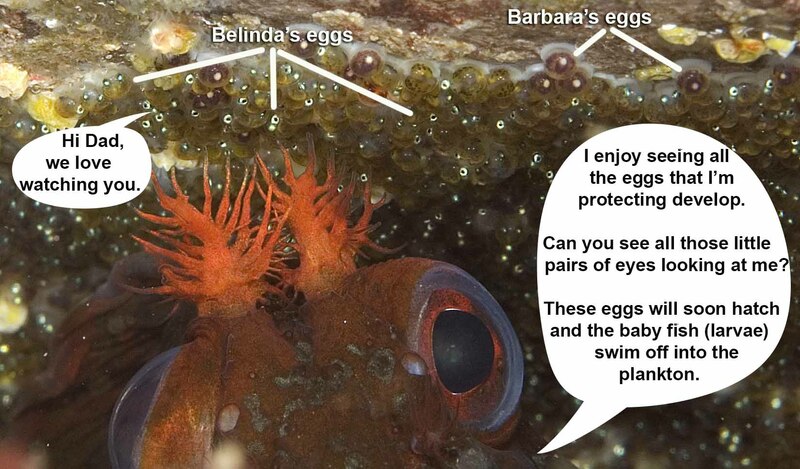 Super-Dad blennies like me guard our eggs http://www.bennytheblenny.com/blog/?p=240, while the single catshark and ray eggs are wrapped in those tough ‘mermaid’s purses’ so they don’t need to be guarded. 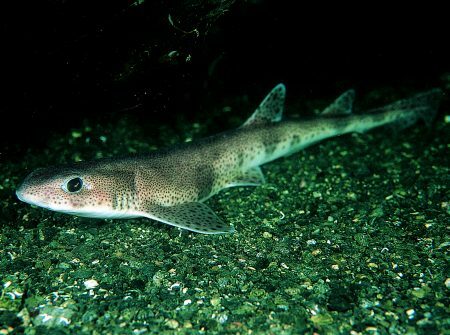 Some fish, like plaice and cod, don’t guard the eggs or give them a strong coat, they just produce so many of them (plaice ~500000, cod over a million) that they reckon a few are bound to survive. That sounds a bit too risky to me! Tompot blenny egg development: it’s not bronze, silver, gold like your Olympics, it’s amethyst, gold, silver! When I’m guarding all the eggs in my crevice, I have plenty of time to watch them develop. Something I notice is how they change colour. You can see in blog 21/4 that when Brenda laid her eggs they were like perfect amethyst jewels, a lovely deep purple, stuck in a very neat honeycomb pattern on the floor of my crevice. As I cared for them, the viable eggs i.e. the ones that were healthy and that I’d successfully fertilised, developed from purple into beautiful golden globes. Over the few weeks after that, they progressed so the baby fishes’ eyes could be seen shining silver. The eyes are large relative to the eggs, so part of the whole layer looks sparkly silver and it feels as though all the eyes are on me!! Because several different females have laid the eggs at different times (this is called partition laying), I am often looking after the three stages of eggs at the same time. Not at the moment though, it’s now the end of the season and I’m just waiting patiently for the last few sparkling silver-eyed eggs to hatch. Phew, I can then build up my strength again because being a ‘stay at home dad’ is very exhausting!! Author Benny the blennyPosted on 5th August 2016 Categories Animal behaviour, children's book, combtooth blenny, egg laying, fish, fish eggs, Paternal care, Tompot blenny, Underwater photographyTags fish eggs, marine week, rockpools, tompot blenny, UK, underwaterLeave a comment on Tompot blenny egg development: it’s not bronze, silver, gold like your Olympics, it’s amethyst, gold, silver! 2’s company, 3’s a crowd, 4’s a harem? Although I have a good number of eggs to guard already, and I’m busy looking after them in my crevice home, females still visit me to lay more. 3 female tompot blennies visiting me at the same time! I usually have only one female visitor at a time (see blog 11/4/2016) but this time for some reason, I had three visitors all at once. The divers, Paul and Teresa were amazed; they’d never seen a male tompot blenny quite that popular before! Maybe it was because the special smells I waft out to attract females were particularly powerful or perhaps none of the other males on the reef have room for more eggs at the moment. That’s me on the right; I’m slightly darker and redder than the visiting tompot blenny females – Beth, Bella and Brenda (yes, we can all be individually recognised see blog 24/3/2016). Luckily, they seemed to get on OK with each other, and I was certainly happy for all three to come in and lay their eggs. I was then very busy fertilising all those extra eggs. What a brilliant breeding season it’s turning out to be. Author Benny the blennyPosted on 24th July 2016 24th July 2016 Categories Animal behaviour, children's book, combtooth blenny, egg laying, fish eggs, glands, Paternal care, Tompot blenny, Underwater photographyLeave a comment on 2’s company, 3’s a crowd, 4’s a harem? It’s a good thing I got my crevice home clean and ready for my female visitors. Just before Easter, a female that we now call Betty came to visit me and she laid a beautiful raft of eggs for me to look after. You can see me in the background of these photographs. The female tompot blennies tend to be paler than the darker more reddish coloured breeding males. In the bottom photograph, Betty is in the middle of laying her eggs and her ovipositor (egg laying organ) is showing. Teresa and Paul came diving to visit us and were pleased to see that we had started to breed. Storm Katie came through a couple of days later so they are not sure whether Betty’s eggs have survived the storm. In any case, I’ll be trying to attract several other female tompots to visit me over the next two months to lay their eggs. Hopefully the weather will improve, so it will be easier for me to be ready for them! When I have eggs to look after, I wipe them over with my special glands (that look like miniature cauliflowers) to keep them clean, healthy and free of bugs. As soon as the sea is calm enough, Teresa and Paul will come and see me again and will be able to let you know how we are all doing. We’re looking at you Dad! Over the summer the eggs that I have been caring for have developed well; you can see them on the ceiling above my head. They look like amethyst gems (see Barbara’s eggs in the photograph) when first laid, then progress to a gold colour with a paler centre. Just before they hatch, their eyes become very obvious and it looks as though they are watching what I’m up to. I still clean all of them regularly by wiping them with my special gland (see blog 26/06/15) and protect them from predators. It won’t be long now before the ones with well-developed eyes hatch. I will be sad to see them leave but my job is done. They need to go into the plankton and find the right size food so they can grow into young fish. For more photos of British marine life why not check out www.marinephoto.co.uk! Author Benny the blennyPosted on 18th August 2015 2nd July 2016 Categories Animal behaviour, Animal physiology, combtooth blenny, egg laying, fish, fish eggs, Paternal care, Tompot blenny, Underwater photographyTags beach, blenny, fish, fish eggs, head tentacles, marine week, nature, ocean, rockpools, sea, shallow water, snorkelling, tide, tompot blenny, UK, underwater, Wembury, wildlifeLeave a comment on We’re looking at you Dad! Close escape today! I was on the ‘balcony’ (all right then, the rock ledge) outside my home, nosing around when whoosh down came a diving bird, a shag. It almost caught me in its sharp beak! I flicked speedily into the back of my crevice and stayed hidden there as the shag continued to swim around my rock, prodding its beak into many of the cracks and crevices looking for food. I saw an unfortunate corkwing wrasse (a type of fish) being crunched. I am now a bit nervous about coming out again. It’s a good thing I spotted this predator so quickly. Having my eyes set so high on my head is a brilliant adaptation that helps me see well in all directions. Author Benny the blennyPosted on 24th July 2015 3rd July 2016 Categories Diving bird, egg laying, fish, Shag, Tompot blenny, Underwater photographyTags foodchain, marine week, shallow water, tompot blenny, UK, underwater, Wembury, wildlifeLeave a comment on Eek, a diving bird! Here, I’m using my pectoral (shoulder) fins to fan water over Belinda’s developing eggs and keep them healthy. I also have a special gland near my tail that releases important stuff to keep bugs from growing on the eggs. Female tompot blennies like Belinda take care to lay their eggs in a single layer that makes it easy for me to give them all a good wipe over. 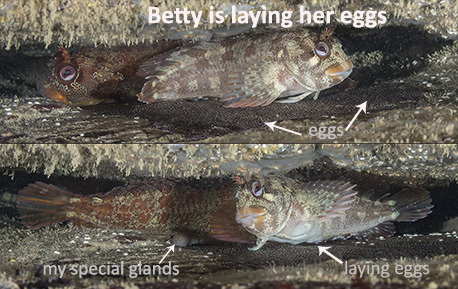 Since Belinda’s visit, two other female tompot blennies (let’s call them Barbara and Brenda) have been attracted by my smelly messages (pheromones) and have been flirting just outside my home at different times. I’ve encouraged them in and they have laid their eggs next to Belinda’s. I fertilised them straight away, as I need to make sure I’m their Dad. I have to be on my guard because lots of animals would love to eat my eggs. I can’t leave them unguarded for more than a few moments so I have to grab my own food very quickly! Benny the Blenny the fish that blogs! Whoosh Storm Freya and Storm Gareth but no ‘Beast from the East’ this year yet! Dad’s duties wiping magic slime on the eggs! SUE PETRIE on Whoosh Storm Freya and Storm Gareth but no ‘Beast from the East’ this year yet! Rebecca Dixon watmough on At last the sea temperature is rising!